Hotel Eden is situated near Central railway station and Circumvesuviana ( Pompei-Sorrento ) and near the highway, tangenziale and asse mediano. It takes only 10 minutes to get to the airport and to the harbour of Naples. Hotel Eden can be easily reached through the highway Roma-Napoli , Bari-Napoli , Salerno-Napoli or through tangenziale leaving Central Station and then taking the road on the right side c.so Novara. Leaving the Central railway station of Garibaldi square take c.so Novara , the large road on the right side, and 50 meters forward on the left side there is Hotel Eden. .
Outside the airport there is Alibus-stop where one can catch frequent buses that lead to c.so Novara. Pompeii Hotels is a hotel reservation service provides you with a variety of accommodation in Pompeii. 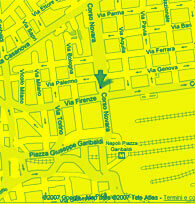 Week End Low Cost is a hotel reservation service provides you with a variety of accommodation in Campania.